The process is easy and starts with selecting the neighborhood for your honorary tree from a listing of eligible locations where street tree plantings are underway or planned. These honorariums require a $1,000 donation, which helps fund our ongoing programs while recognizing someone near and dear to your heart. A letter and tree certificate indicating the location of the tree and donor information will be mailed to the person being honored or the person of your choice. 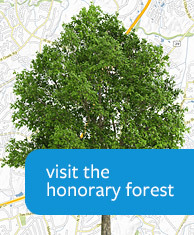 Recognition of your contribution on the “Honorary Forest” page of our website. A locator map on the TreesCharlotte website showing the tree location and gift details. Select a planting area by clicking on one of the green circles on the map below. Once you have selected your desired planting area, click on the “Select this planting area” link to navigate to the order form. Complete and submit the order form. Complete your donation of $1,000 online or by sending a check to: TreesCharlotte, 701 Tuckaseegee Road, Charlotte, NC 28208. Can I choose the location? Where will my tree(s) be planted? Yes, you may select a neighborhood location from a listing of areas where new street trees are planned. We are not able to provide a specific street level location, but you can select a neighborhood. Due to the nature of our work, we are not able to place markings or identifiers on trees. After your contribution has been confirmed and entered into the City’s official tree database, you and others will see the specific tree location on our web site with recognition of the honorees, donor(s), date and tree type. A letter and special tree certificate will be mailed to the person of your choice. What does the honoree receive? The honoree or the person of your choice will receive a letter and tree certificate identifying the tree location and the donation. Where does my contribution go? All gifts go to TreesCharlotte to expand and diversify our urban forest, and to educate residents on tree care. Can I make a dedication for other occasions besides memorials? Yes! Gifts to the Honorary Forest Program may be made to commemorate any occasion, including birthdays, anniversaries, weddings, graduations and many more. How do I arrange payment for my gift? Follow the instructions above to: (1) select the planting area for your tree, (2) complete an order form and share information about the designee of the tree, and (3) make a donation to complete your order. Your donation of $1,000 will be made through the TreesCharlotte website via Anedot.